I came across this disturbing image during my research on mass housing. It struck me as the most depressing and dehumanizing architectural moment to the best of my recollection, I was profoundly fascinated. Here's a quick rundown of the building. 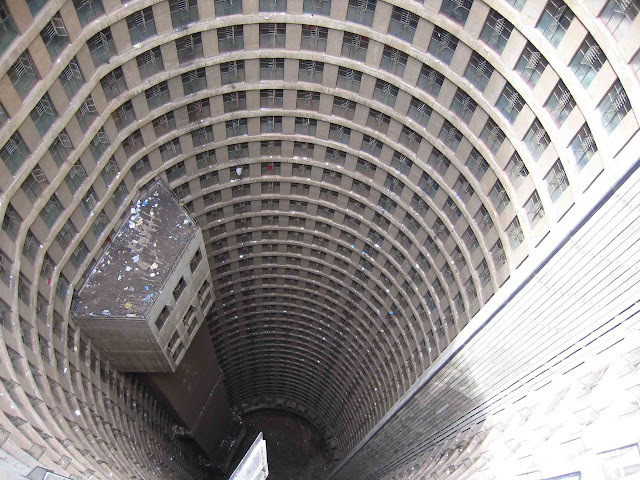 Ponte Tower, designed by Manfred Hermer, also known as the Ponte City Apartments, was built in Johannesburg in 1975, and is still the tallest residential skyscraper in Africa. 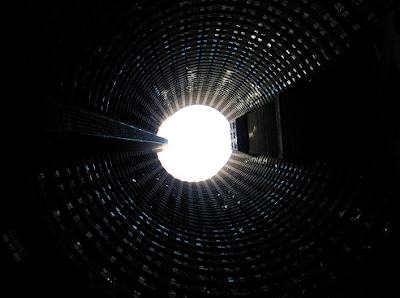 It is a 54-story tube with an open center to allow additional light to reach its inner apartments. It was in its heyday one of the city's most coveted addresses, described by newspapers at the time as "heaven on earth". 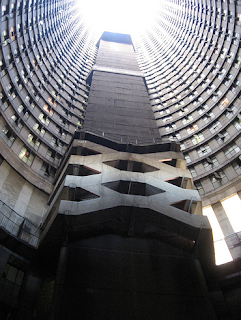 Ponte Tower was a true example of Apartheid-era thinking. The apartments facing the outside of the building were designated for rich white families while the inner apartments, in permanent twilight, were meant for their black servants. 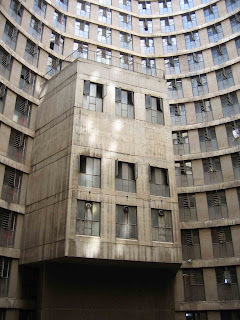 Life in the building became truly brutal after the fall of Apartheid. 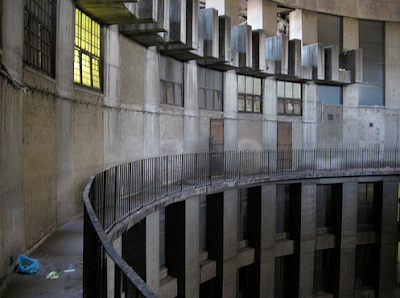 As crime rose in the once-upscale Hillbrow neighborhood, numerous gangs moved into building. 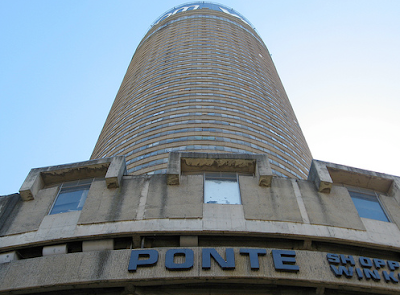 Ponte Tower became a center of organized crime activity, and life in the building become extremely unsafe. The building has been dubbed as ‘suicide central’ - people from all over town would go there to jump. The windows around the inner core were all barred, and most still are. Owners all but abandoned the structure to decay. At one point the garbage piled five stories high in the open inner courtyard of the building. Fun Fact #1 Danny Boyle maker of Slumdog Millionaire and 28 Days Later has made a political thriller that was shot on location in this tower. Fun Fact #2 There was reportedly a huge effort to clean up Ponte City in order to use it for athletes’ residence during World Cup 2010. However, there were questionable business dealings, controversy, and, eventually, no project. Fun Fact #3 Ponte hit its lowest point when in 1998 it was suggested that it be turned into a prison, an idea soon discarded. Dear Mr. Hermer, You know you failed as an architect when your building raises suicide rates, stars in a blood-fest thriller, and evokes convert-to-prison proposals. Please stop stealing my pictures!